Cease all external e-mails on your account including dating alerts, registration and support mail. We provide high visibility links on all e-mails to opt out both at the bottom and the top so that you may do this at anytime in an easy and swift process. Do this at anytime by submitting the form. You will immediately receive an e-mail to state that your match preferences have been reset. You may also wish to cease all e-mails from your account which you may wish to keep open. You will receive one last e-mail with your login details and confirming that your account e-mails have been switched off. You may login and go to My Control Panel to switch your e-mails back on at anytime. You will still be able to retrieve your login details if you should ever mislay them but an e-mail will only be sent at your request. Match e-mail : Switch off match e-mails from your Match Centre accessible from your Members Control Centre. The system will confirm your change of preference. 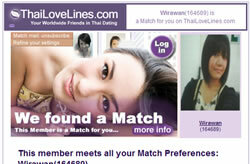 You will still see your matches under My Matches when you log into ThaiLoveLines.com. Email and Social Network e-mails : These can be switched off from My Information which can be accessed by going to My Control Panel. You can resume receipt of these e-mails in due course. However some immediate contact alerts cannot be switched off. These are required as a member of ThaiLoveLines.com. It is site policy that all members have a valid working email account. To stop these communications, you must de register from our site which you can do here. Your registration will be removed within 24 hrs (see link above). Selecting the opt out option at the bottom of any newsletter. Note: We currently do not send newsletters but they will re-start in February 2011 once our current e-mail programme is re-structured. Please see our e-mail policy in the links panel. If you have any particular problem with e-mail on ThaiLoveLines.com or wish to clarify any matter dealt with here, please feel free to e-mail our support desk where your issue will be dealt with or your contribution given attention. 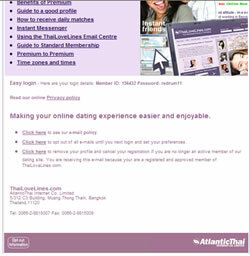 (Above) You will find an opt out link both at the top and bottom of all e-mails from ThaiLoveLines. There is also an e-mail policy statement. 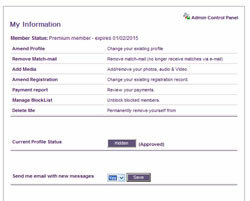 You can switch off all e-mails by going to My Control Panel from your Members Control Centre or other profile pages. (Below) Match e-mails can be switched off and on by going to your Match Centre. An opt out instruction is available at the bottom of each e-mail.